Jokes are remarkably potent tools for sending messages; some strike a nerve or cause hysterical laughter, yet others mock the sociopolitical conditions of the world with surprising accuracy. The latter is tricky and genius in ways we don’t always realize; once we’re done laughing and return to our quotidian lives, there’s usually a bone-chilling message left behind that we can’t stop thinking about. Nowadays, the most acclaimed news bearers are our comedy show hosts. Whether it’s the dry witty sarcasm of Stephen Colbert, over-the-top lip syncing with Jimmy Fallon, in your face facts with John Oliver or extravagant skits with Saturday Night Live, they all have their own idiosyncratic way of doing things. In the past few months, politics has had a lot of room for humor, and obviously every comedian takes advantage of this fact incorporating it into his/her acts. 2016 was the year when the line between comedy and reality was so blurry people couldn’t tell them apart; the state of the world may have very well been a satirical act. Although, it may seem that political comedy came to rise in recent times, it has been around for awhile now. In particular, Weekend Update is the longest running news satire show on television in the U.S.; some form of this segment has been running since 1975. 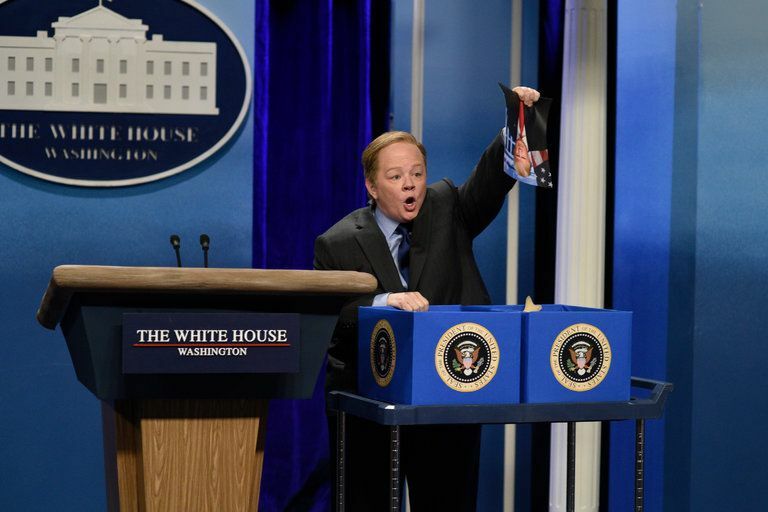 Saturday Night Live also dates back to 1975 and recently featured Melissa McCarthy as Trump’s press secretary Sean Spicer. Her performance showcased all the flaws and ambiguous responses we received from Spicer recently, sending a strong message of disapproval on the way the current administration has been handling things. Alec Baldwin’s SNL impression of Trump before the election gained so much traction that the President himself commented on Twitter: “Watched Saturday Night Live hit job on me.Time to retire the boring and unfunny show. Alec Baldwin portrayal stinks. Media rigging election!” Yet Baldwin’s performance was so popular he reprised the role in 11 out of the 14 episodes this season. Trump took to Twitter yet again to voice his opinion on the show: “Just tried watching Saturday Night Live — unwatchable! Totally biased, not funny and the Baldwin impersonation just can’t get any worse. Sad.” This goes to prove that the President is worried about how he’s portrayed by comedians. The fact that he not only watches these impressions of him, but also goes out of his way to voice his disapproval means that he recognizes that these satirical acts are forces to be reckoned with and acknowledges their ability to alter the way the public looks at him. Comedians, whether their portrayals are accurate or not, attempt to shed light on the flaws or fallacies of the most powerful people in the country and world, as speakers of truth and a voice for the public against authority. This ability to throw jabs at people in the White House is pure, unadulterated power and an increasingly essential tool in standing up to people in influential positions. Comedy affects how today’s society functions and it cannot be ignored, either love it or hate it. A huge topic of discussion in 2016 was on ways in which the media affected the election and every candidate recognized this; comedy manages to approach this in a relatively positive and light-hearted way that nonetheless carries depth. Comedians have the ability to shatter the fake personas that most political leaders maintain to keep themselves safe and that remains important in today’s day and age of constant facades and lies. These comics continue to have a vital role, constantly commenting and criticising every decision our elected leaders might make — unless the media is gagged like the EPA.